Bowling Green State University has had two new dining halls and an All-You-Care-to-Eat meal plan option since last fall. These changes have caused issues with waste and student dissatisfaction. 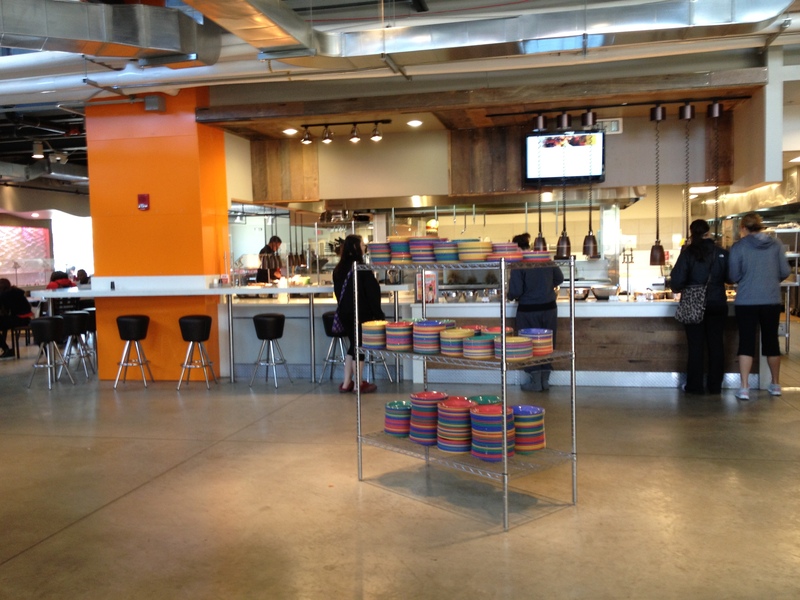 Chartwells runs the dining services at BGSU and a wide variety of other colleges and schools. Chartwells has incorporated the AYCE meal plan at schools before, so the issue of food waste was to be expected, said Nicholas Hennessy, sustainability coordinator. Since the AYCE meal plan option is new this school year, students still need to learn how to take only the amount of food that they will eat. This increase in food waste is part of the “typical learning curve of food waste,” Hennessy said. Some other schools, such as Ohio University, that have the AYCE meal plan also have compost programs for organic materials, said Hennessy, but BGSU does not. 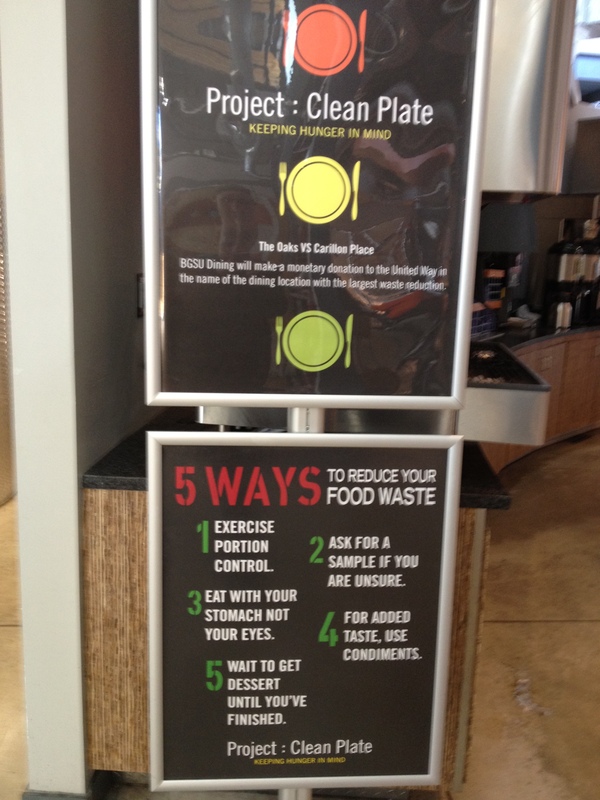 Rather than having a compost program, BGSU is trying to educate students on food waste through the Project Clean Plate program. This involves table tents, signs and fliers with tips for students to read on how to waste less food, Hennessy said. Also to reduce waste, the new dining halls operate without trays or disposable plates and eating utensils, there are fountain beverages rather than bottled beverages and students have the option to sample the food before they put it on their plate. Dining Services Director Michael Paulus said Project Clean Plate is very successful at raising students’ awareness about food waste. 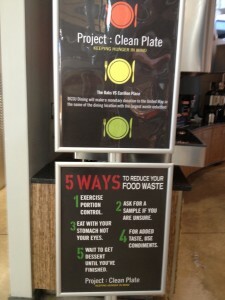 Jessica Williams, a sophomore clinical psychology major at BGSU, said that she does read the Project Clean Plate signs, but those signs are not effective in getting students to reduce their waste. Williams said that in order to reduce food waste, the Oaks and Carillon Place should have samples sitting out because students are not likely to ask for samples. Seanice Reynolds, a freshman business major at BGSU, said the Project Clean Plate signs do not help students waste less food. Reynolds also said that samples should be put out so that students do not take too much food. Both Williams and Reynolds said they tried the meal plans involving swipes last semester but were unsatisfied with it, so they switched back to the retail plans this semester and are much more satisfied now. Last semester, Williams tried one of the custom meal plans, which includes both falcon dollars and swipes, and said that “it doesn’t work at all,” because she struggled with running out of falcon dollars. Williams said she does not recommend the custom meal plan to students unless they really like the Oaks and Carillon Place. Cassandra Scenters, a senior liberal studies major at BGSU, said she noticed many students running out of falcon dollars when they tried the custom meal plan. Scenters also said that while there are benefits to having a meal plan, she wishes there were more commuter meal plan options. The three commuter meal plans only include swipes at different amounts with the option to add falcon dollars, according to the campus dining website. The purpose of the AYCE and custom meal plan options is to create variety and customization and increase value and health, Paulus said. BGSU went from having three basic meal plans to having nine meal plan options this school year with no price increase. 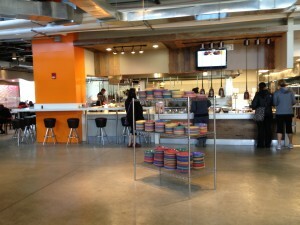 This is the first time in 22 years that the meal plan prices have not increased, Paulus said. Paulus also said that there are now more meal plan options because “one size does not always fit all” and the needs of a freshman are very different from the needs of a senior. This entry was posted on Thursday, April 26th, 2012 at 5:53 am	and is filed under BGSU, Enterprise Story, Spring 2012. You can follow any responses to this entry through the RSS 2.0 feed. Both comments and pings are currently closed. Good job Blythe! Very interesting story. Nonetheless, I’m certainly happy I found it and I’ll be book-marking it and checking back often! This site certainly has all of the information and facts I needed about this subject and didn’t know who to ask. You definitely put a fresh spin on a subject that has been discussed for many years.